A 2 bedroom detached house in Lania with communal swimming pool and magnificent panoramic views across the valleys beyond the almond orchards and vineyards and up to the mountains. The house is approx. 200m from Lania village, which is accessed via a road edged by a paved footpath. All the floors have good quality tiles and there is a marble staircase with wrought iron handrail and a top landing with wall cupboards. Shower room has shower, toilet, washbasin and illuminated cupboard. Both bedrooms have floor to ceiling built-in wardrobes in modern design and complete with hanging space, drawers and shelves. There is a patio window leading onto the balcony with ample seating space. All the windows with the exception of the kitchen, stairs and shower room have blinds and curtains. The Calor gas central heating system heats the water and there are radiators in the living area, cloakroom, shower room, and both bedrooms. The house is fully wired for phone connection. A loft above the reinforced concrete ceilings above the first floor has a 2 cubic meter tank for reserve mains water. The garden area has been well finished with white limestone chippings and is well stocked with trees, shrubs and flowers. In one corner of the garden there is a well equipped shed complete with shelves and a bench. The driveway is fully paved and provides ample space for two cars. Access is through double steel gates and a side pedestrian gate.There are two patios, one at the rear and one at the front of the house. There are external electric lights on the outside walls and either side of the main gate. Well constructed breeze block steps lead up through the gate to the communal swimming pool, which will be shared with the 11 other properties in this development. Kitchen: Fully fitted in modern style with cupboards and breakfast bar. The refrigerator is in a cupboard unit incorporating storage for ironing board, clothes dryer, brushes etc. Plus two overhead cupboards. Living area: There are two windows and a large patio door giving access to the front patio. Cloakroom: Accessible from the living area and having toilet and washbasin etc. 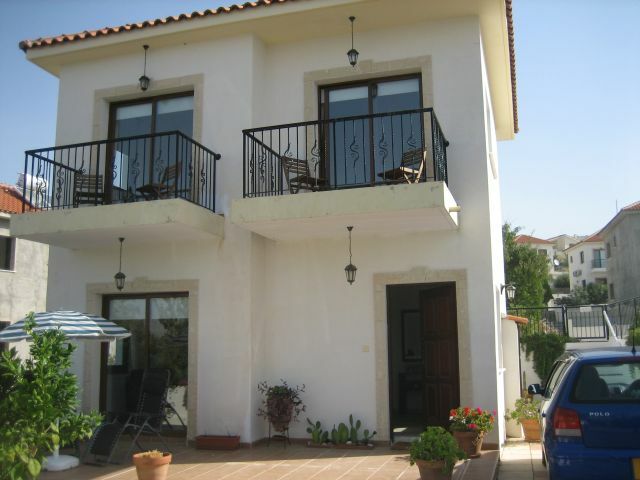 2 Double bedrooms: with built-in wardrobes and furnished.